I love writing about players that have had a great winning streak and boy do I have a good story for you today! A player known at "Mr S" at cowboy-themed High Noon Casino had the kind of winning streak the other day that the rest of us just dream about! 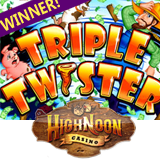 He won nearly half a million dollars playing the Triple Twister slot game -- during the game's free spins feature yet! “Mr S” deposited $350 and claimed a 75% match bonus on March 28. He was doing alright and enjoying the casino’s huge selection of games when he had his first big win. It was April Fools Day but his $249,875 win was no joke. Then, just three days later, he was playing Triple Twister again and hit the free spins feature again. This time he won another $168,960. Unbelievable! Triple Twister is a tornado-themed slot game. Three or more Weather Vane scatters trigger 9 free spins. Like many RTG games it has a Win-Win feature that ensures everyone’s a winner during its bonus game. Western-themed High Noon Casino has hundreds of slots and table games from Realtime Gaming. New players from around the world are welcomed with a casino bonus of up to $2000.